If you do not wish to sow your seeds immediately on receipt, place the packets in a screw-topped jar and store them in the fridge - not the freezer - until required. They can remain viable for several years. The best time to sow polyanthus, acaulis and auricula is between February and April. A little frost can aid germination, but in very severe areas you should delay sowing to March or April. You will still get flowers in the following spring if you sow before the end of May. Sowings can be made in June or up to the end of July if it is really necessary, as long as you keep them cool and moist. The later you leave it, the more difficult it is to bring small plants which are not well established through a winter season. Sieboldii are best sown from November to January and left outside. They can be moved into a shaded frame in February. Primula seedlings are very sensitive to concentrations of mineral salts found in fertilisers. If the mixture is too strong the seedlings may not grow at all, - or the young roots may be killed. Always use a seed compost and look for one which is as gritty and fibrous as possible. Primula roots need air to grow and develop. 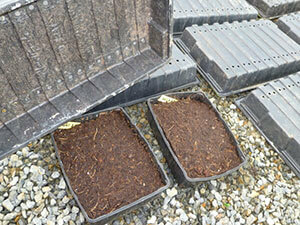 If the compost is too fine, a few waterings will drive all the air out. 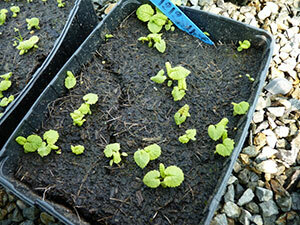 Primula seedlings need light and air to germinate. Sow on the surface of the compost and do not cover with soil. Seeds which are slower to germinate ( double primroses, hose-in-hose, jack-in-the-green, auriculas and most of the species can be sown on a layer of vermiculite or very fine gravel over the compost. Water them in with a fine rose. Place a seed tray (perforated) of the same size over your sowings (to protect the seed when left outdoors) and weigh it down with a stone. Leave the lot in a shady place outdoors. Inspect regularly and water as necessary. Do not allow the compost to dry out. As soon as the seeds sprout remove the cover. Protect against slugs. Polyanthus and primrose sprout within three weeks. Auriculas are slower and Sieboldii may take six weeks. Most of the species need natural freezing and thawing to get them started so it's important to sow as early as possible. High temperatures inhibit germination. Drying out - especially at the moment of germination -is usually fatal. Don't plant your seeds under glass, as temperatures rise too high on sunny days , - even in winter!! Ideal germination temperature is between 12 and 15 degrees Centigrade. Lower temperatures do no harm, but anything over 18 Centigrade is fatal. NEVER use a heated propagator. Primulas establish much faster if a good root system has developed before they are moved. Wait until you have at least four leaves before you prick out. A feed with a half-strength high potash fertiliser a week before pricking out helps. P. alpicola seedlings ready to be pricked out.